Located on St Giles Piazza, next to Ippudo and Kanada-ya you will find a neat little Korean spot serving up traditional Korean dishes. You can see their BBQ hot plates firing Korean BBQ noticeably from the windows with diners preparing their BBQ meats to their liking. When you enter, you will be greeted with a spacious booth dining area, while the glass walls and high ceilings provide for a bright and airy space. The setting is ideal for a group dining experience. We began our meal with the Yuk Hwae (£7.50), a traditional Korean beef tartare that was both delicious and fragrant, served with slivers of nashi pear this added texture and fruitiness. This was excellent. 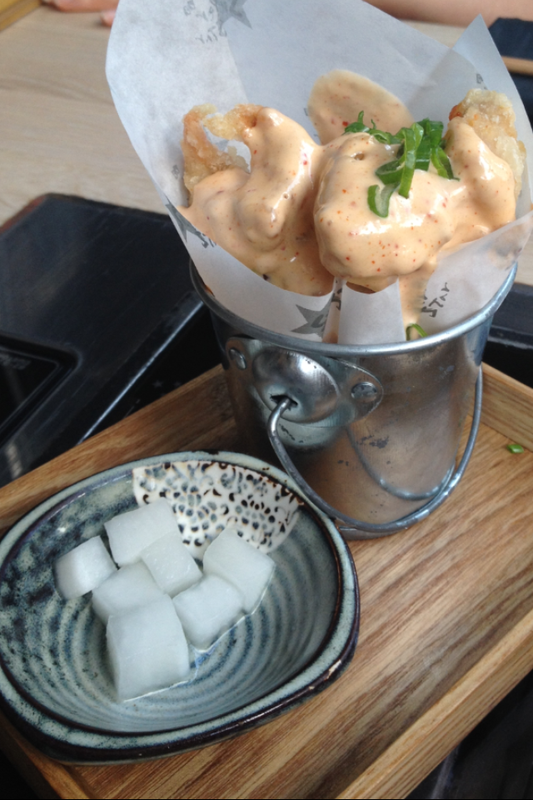 The Korean Fried Chicken (KFC) (5 pcs £5.50) was good with the kimchi mayo. However the batter of the KFC could have been crunchier to create the perfect KFC. In contrast, the Korean style spicy wings (5 pcs £5.50) were rather disappointing as these were bland. 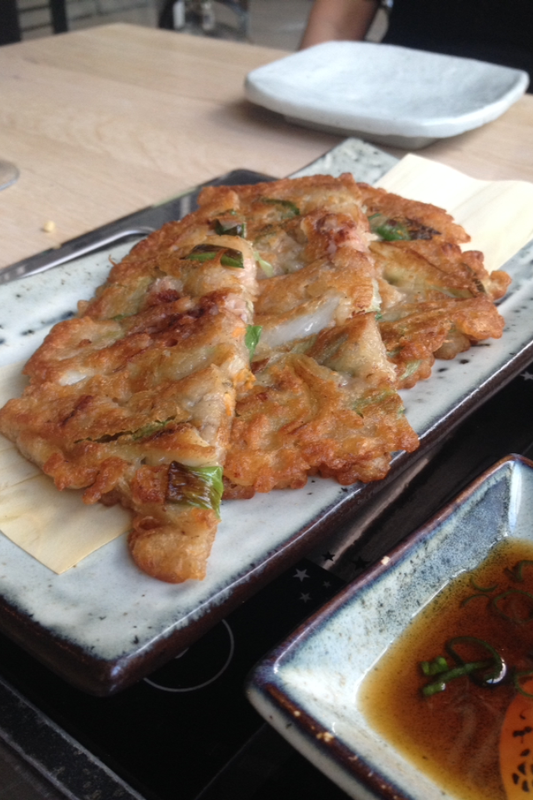 Pa Jeon – Seafood Pancake (£6.50) is a traditional Korean pancake served with pan-fried spring onion & mixed seafood. This dish was incredibly tasty, filled to the brim with delicious chunky pieces of seafood. At £6.50 this was exceptional value and very filling. I would highly recommend having this dish. 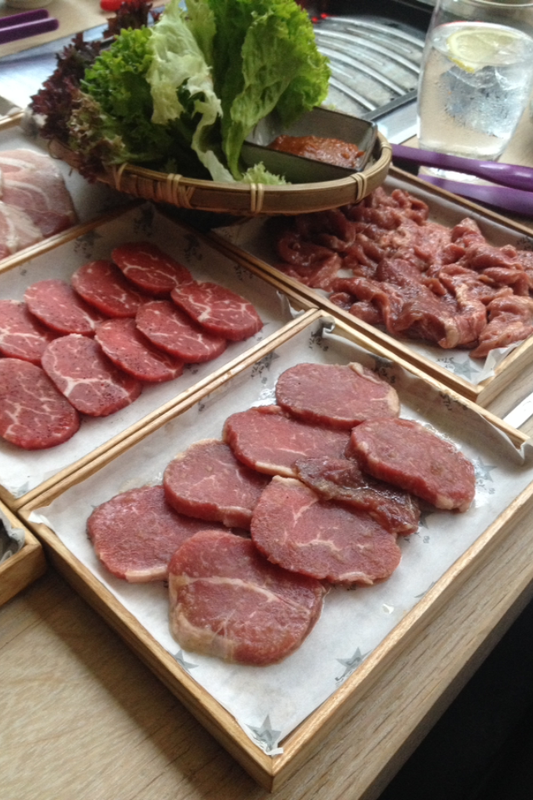 Onto the main attraction – the Korean BBQ, we ordered a selection of meats and seafood from the menu to prepare over the hot plates. Everything we ordered were well priced and the serving sizes were very reasonable for their price point. These came with dipping sauces for added flavour. Overall the meats were of a good quality however, we found the overall experience of the BBQ was quite bland as they were lightly covered in oil for barbecuing. Most of the selection was not served marinated unless stated so I felt that it was important that the dipping sauces that accompanied the BBQ were really flavoursome to counteract the simplicity of the meats itself. Our favourite picks from the menu were the tiger prawns (£8.50), marinated lamb ($7.50), sesame & garlic sirloin (£8.50) and the rib eye (£10.55). 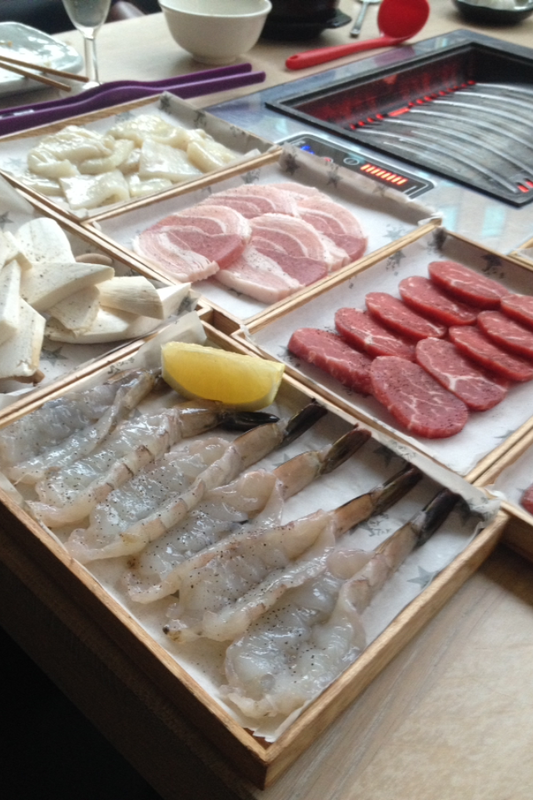 From the BBQ menu, we sampled the marinated lamb (£7.50), tiger prawns (£8.50), pork belly (£7.00), sesame & garlic sirloin (£8.50), rib eye (£10.55), squid (£7.00) and mixed mushroom (£7.00). Overall, the meal and service was pleasant. 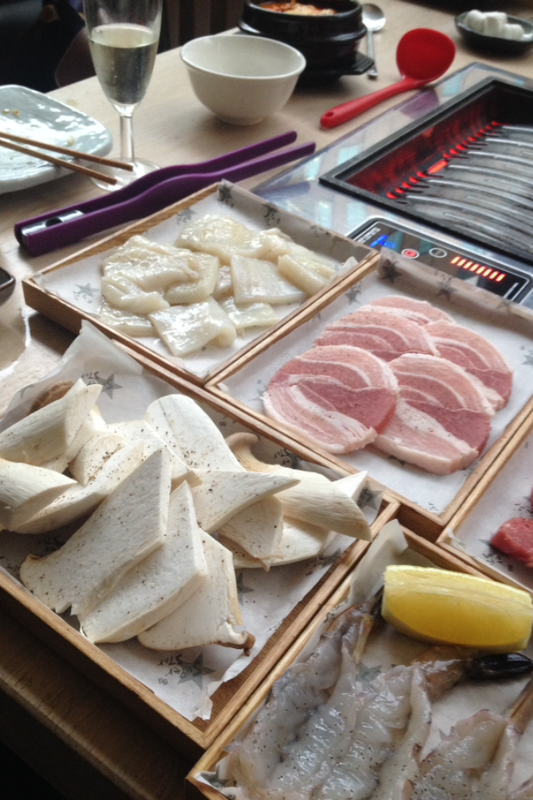 However, the dishes from the al la carte menu stood out more than their Korean BBQ – the main attraction. There was an abundance of choice from the al la carte and BBQ menu, so there was plenty of good food to be savoured, perfect amongst a group of friends/co-workers. 1. 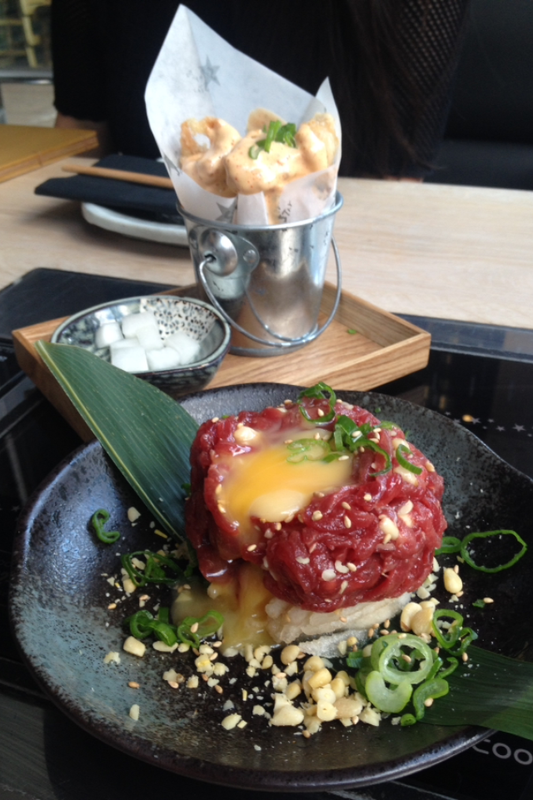 Yuk Hwae – traditional Korean beef tartare was excellent. 2. Pa Jeon (seafood pancake) was delicious and filled with seafood. 3. Overall the Korean dishes were very tasty. 4. Price point, very good value. 1. The Korean BBQ was ok considering this was the main attraction.